The Tahoe lifestyle can be enjoyed throughout the year, and what better way to partake in all that Lake Tahoe has to offer than from your own home right on the Lake? Lake Tahoe lakefront real estate begins around $1,500,000 for a condominium and $2,000,000 for a single family home with occasional gems found for less. They can reach $20,000,000 and higher for the most luxurious estates. The shoreline of Lake Tahoe stretches an amazing 72 miles and hosts a limited number of homes scattered along the lakefront. Due to restrictions on new developments, Lake Tahoe lakefront homes for sale are both unique and coveted, properties with piers and waterfront access doubly so! Having a pier can add $500,000 to $2,000,000 in value – and with a restriction on new piers being built, this value is only set to rise. Imagine strolling from your porch to your pier and hop in your boat to cruise the crystal blue waters of Lake Tahoe. You could zip over to a private cove for a swim, stop in at the famous Sunnyside Restaurant and Lodge on West Shore for lunch, or just relax as you cruise through Emerald Bay. There are a variety communities with Lake Tahoe lakefront homes for sales. Cabins and large lakefront estates can be found along the North Shore which runs west from Incline Village through King’s Beach, and down to Tahoe City. Lake Tahoe lakefront properties are so highly valued that only the most fortunate can snag up one of these highly valued properties. Breathtaking views can still be yours, and many lakefront communities like Chinquapin and Dollar Point offer recreational resources to local owners like piers with buoy fields, swimming pools and sandy beaches. The historic properties of Tahoe Tavern and Tavern Shores include Lake Tahoe lakefront real estate that can’t be missed. What better place to live the Tahoe lifestyle than in the heart of Tahoe itself, located so close to Tahoe City you can walk there! The West Shore picks up south of Tahoe City and runs through Homewood, Tahoma, Meeks Bay, and down to Rubicon Properties with prized sandy beaches called the Gold Coast. Many of the West Shore properties offer larger acreage parcels that provide a peaceful private setting away from the highway. Also on the West Shore are 3 prime condominium lakefront developments. The most exclusive is Fleur du Lac situated on15 acres of land has 22 units ranging in size from 4,300 to 6,000 sq ft. and features their own private harbor pool, tennis and yacht club. Cedar Point has just 18 units which also has fantastic amenities and are rare to come up for sale. Chambers Landing has 42 units on 13.5 acres of land. Once again they have fabulous amenities and are located right next to Chambers Landing bar which is the oldest bar on Lake Tahoe. 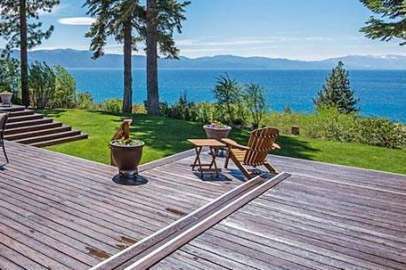 Memorable mountain views, endless green forests, a bounty of all season recreational activities, and the beauty of Lake Tahoe itself are just some of the reasons Lake Tahoe lakefront homes for sale is sought after worldwide.